Gentle Readers. Last week I wrote about several events that I took pictures of in 2015, which I had intended to write blog posts about, but never did. It was a cursory plea for input–which of these would you like to hear about?–since I didn’t think I could flesh them all out: time is finite, after all. I was pleased and a bit surprised at the response–and I found that you all are a sweet bunch and a tiny bit greedy, too. 😉 I’m going to work my way down my list of topics and stories, throwing one from that list into the blogging schedule every now and then. Thanks again for your input, and for checking in with me so often. Just a tip: so you don’t miss your favorite, you might want to put your email address in the little box thingy to the right. Also we have a lot of fun on my vomiting chicken Facebook page, so you might wanna hook up with me there, too! First up: how to make Ramen! I guess eating Ramen in a restaurant is a “thing,” like chicken sweaters and keeping gerbils and wearing mismatched socks and homesteading and using mason jars for everything from soup to nuts. I only know this because (okay, I just threw in the gerbils part because we have a few gerbils to sell . . . but they could become a trend! . . . they should become a trend!) I have the pleasure of having lots of young people in my life. These youngsters are not only as bright as proverbial pennies, they are generous and sweet to share with me (being mildly curious, but not quite as bright or sparkly) their finds. This is so-not your college-student ramen, that comes in a packet at the store. No, indeedy, it’s not. “Ramen?! You went OUT for Ramen?! ?” That may have been my croaked response, staring incredulously at these two. They are bright, prosperous young professionals, after all, and what they choose to spend their money on is certainly their business . . . but when you can buy a packet of ramen at the grocery store for 39¢, why on earth would they pay seven or eight bucks for a bowl of it?? I think I might have been merely thinking that, or maybe it actually came out of my mouth? I don’t remember (cough). They both turned to me after my inelegant response, and, aware of the fact that I do, indeed, live under a rock, they spoke to me in kind and gentlemanly tones. And patient. Sweet young men, they are, to a proverbial fault. Ramen, to me, of course, was what Bryan and I lived on in our early married years. We were penniless (literally, we didn’t have pennies to our name, bright and sparkly or dull and corroded, either), both of us going to college full-time and working just enough to buy books and paint (I was an art major) and a bit of grocery money: enough to buy the cheapest choices in the produce aisle, and packets of ramen. Now and then a dozen eggs, which were cheap fuel back in those days. A gallon of milk, but not every week. We’d make this cheap, filling, but nutrient-poor food for meals several times a week–ramen noodle soup–as I’m sure plenty of college students still do. You can buy a case of these packets for just a few bucks, and fix the noodles and broth as-is, adding the little flavor packet in at the last minute. If we had a few carrots to shred into the broth or maybe a couple of green onions, or a handful of leftover chicken meat, we’d add that to the soup too, and we felt pretty wealthy on those nights. I am not exaggerating a wit, by the way. We were poor, but it was a deliberate and hopefully temporary type of poor–Bryan was going to finish his degree, of course, and I was doggedly determined to not become one of those wives who quit school before I was finished. I really wanted to finish my degree, and I did. Probably in part because of that cheap ramen. I owe it a debt of thanks. I can’t stand it now, but I’m still grateful for it. Many add-ins makes for a really spectacular soup! We ate so much of that cheap, packaged ramen during our lean college years, that I couldn’t look at a packet of ramen noodles for years afterwards without feeling a bit sick. Also I developed a severe allergy to MSG, the main flavoring ingredient of this college years dietary mainstay, so even when little Mack craves ramen (he loves the stuff) I don’t dare even take a taste, even if it does smell good. And some days–you know–it does. Kind of. In a quasi-sentimental way. Now that so many years (cough) have passed. But anyway. Back to the restaurant Ramen trend. Once I scooped my lower jaw off the floor, I asked the guys to tell me of this allegedly fantastic restaurant. I pictured a sleep-deprived college student in the back room, boiling water and dumping the little packets of noodles into it, one by one, and then bringing out steaming bowls of the stuff to the patrons there. And holding out his hand: “Eight bucks, please.” There would have to be a warning on the wall, for folks like me who are allergic to MSG. Possibly a carrot could be shredded into the soup for an additional buck or two. The two disavowed my notions pretty speedily, though, telling me about the vast steaming bowls of Ramen, augmented. Made from scratch. Lots of good stuff in them, too, not just noodles and a MSG-laced flavoring packet. Now this was a new notion in my head, which I enjoyed entertaining. Fresh herbs. Meat of your choice. Noodles. Special sauces and spices. Et–gloriously-sumptuous–al. 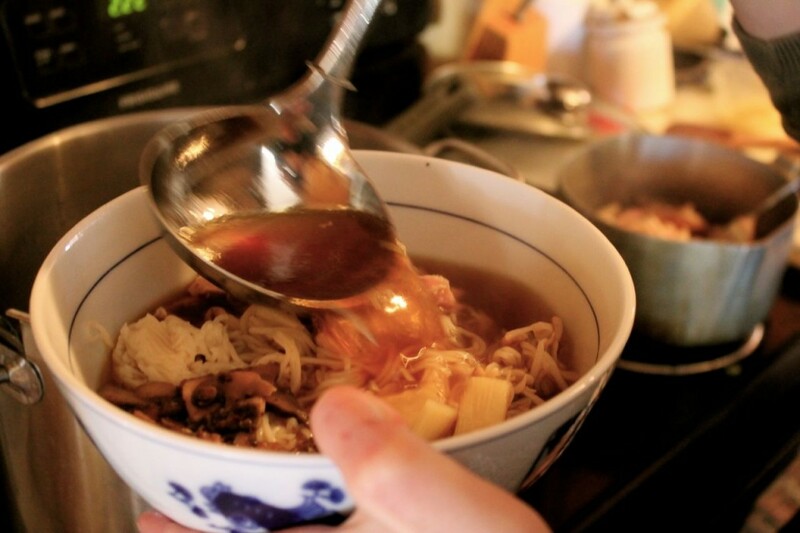 An excellent broth, of course, is key to wonderful homemade ramen. And speaking of entertaining . . . our soon-to-be (at that time, now it’s a fait accompli) son in law Saia, was going to have his little brother John stay with him for a few days, and we had invited them over for a meal. 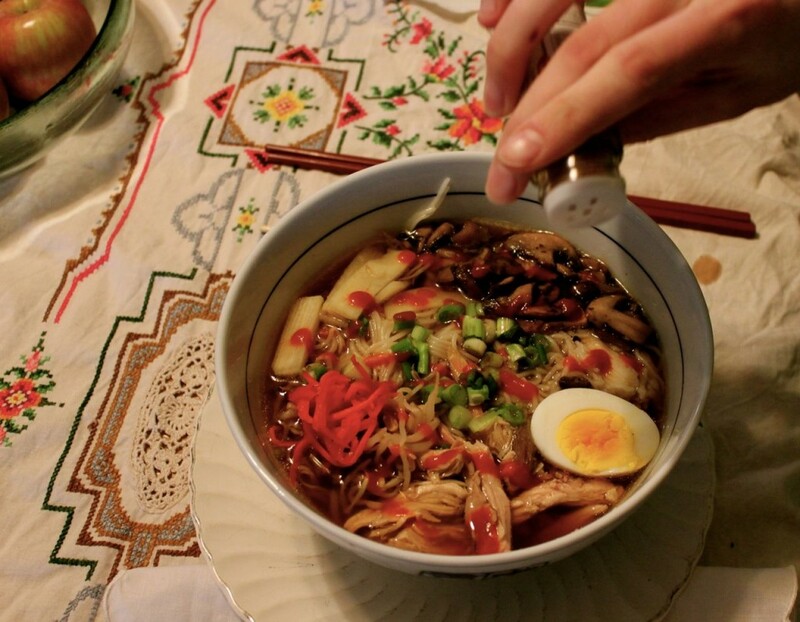 I’ve written about this new family connection before in this space–John is an NFL football player–heck, I drove in to Mom and Dad’s place last night and they were watching John’s team on TV, hoping for a glimpse of him–Amalia and I decided that making our own special ramen (not a flavor packet in sight!) was what we were going to prepare. So Amalia and I scrabbled up a recipe (Bon Appétit magazine) and made a shopping list, with great excitement. We were in the city the week before the big event, and so we stopped at an Asian market to buy some nice new bowls and porcelain spoons, as well as several key ingredients that we knew we wouldn’t be able to find locally. Yum-yum-yummm! No need to go to that restaurant, boys! We made roasted chicken broth, instead of pork (which is what the BA recipe called for). After all, when you have a freezer full of excellent stew hens, you tend to err on the side of the chicken. We stripped down the recipe in a lot of other ways, too, because not everybody has 3 days to spend making soup, right? And that’s not hands-on time, mind you. You just have to get started the day before. Now are you ready for the recipe? First, you need an excellent roasted broth. We made ours out of a couple of stew hens, though you can make it out of a broiler from the store, if you’d like. Or you can go to the original BA recipe here and make it out of pork. Just please–oh, please–don’t buy a box of broth, or stock, and expect it to be wildly delicious, which it will be if you make your own. Trust me on this. Besides, making an excellent roasted broth is simple: Preheat oven to 375 degrees. Rinse off a large(ish) chicken–3 pounds or more. Grab your largest roasting pan, and position the chicken, breast side up, in the middle. Around the chicken, place the broth ingredients listed above. Slide into the oven and roast until golden and steaming, about 45 minutes to an hour. Carefully use tongs to turn the ingredients, including the chicken. When everything is browned and pleasantly roasted, remove the chicken and let cool. Dump everything else—cooking juices, veg, and so on–into your largest stock pot. De-bone chicken, and chill the meat. Put the remaining bones and skin into the pot with the veg, and fill with water to cover. Bring to a boil, skim foam off, cover and simmer for 2 or 3 hours. Take off heat, and let cool, then strain through a colander, pressing the solids down to get every drop. Chill overnight in the ‘fridge. Second, make your dashi: combine kombu and 4 quarts cold water in a large bowl. Cover and let sit at room temperature at least 8 hours and up to 12 hours. For the tare, combine soy sauce, sake, and mirin in a small bowl; cover and chill. The next day: Remove the solid fats from the top of the broth, reserving for another use if you like. Bring your chilled broth to a simmer while you are preparing other ingredients. Remove kombu from dashi, draining well, and add to broth. Cook ramen noodles in another large pot according to package directions, until al dente, drain and keep warm. Slice mushrooms and sauté in butter until just done. Put halved boiled eggs, bean sprouts, shredded chicken meat from the day before, and all other veg in separate bowls. When you’re ready to serve (that is, when all are assembled!) heat broth to a simmer. Heat reserved chicken in a small amount of broth and keep hot. (Yes, you’ll need all your burners for this!) Divide cooked noodles between 6 deep bowls. Add hot chicken meat, and ladle hot broth over all. 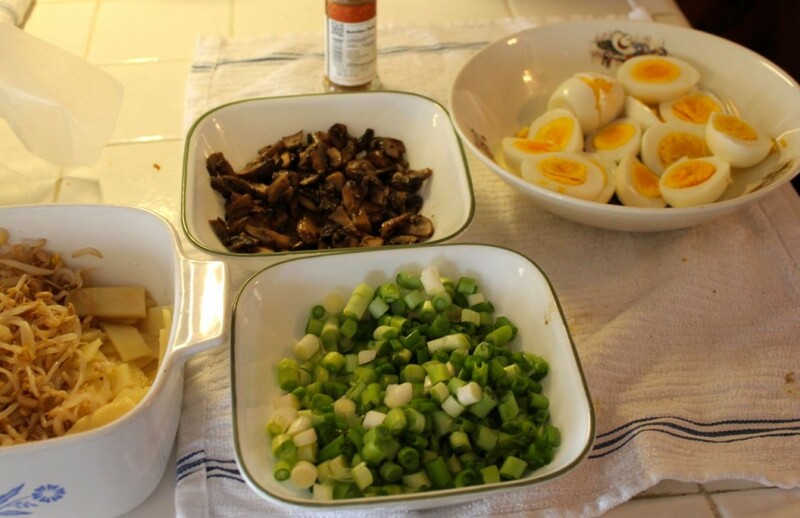 Add along the sides (see photo above) bean sprouts, bamboo shoots, mushrooms, one half boiled egg, and sprinkle chopped green onions over all. Serve with sauces and spices on the sides. Ta-daa! That’s not so hard, is it? And I got confirmation from the two fellows in question that our ramen was every bit as good as the restaurant stuff. ← Remodeling the Kitchen, Part 4: The second FAIL I’ll own up to . . . It does sound wonderfully exciting and just the right challenge for a chef with a heart for adventure. In my house we make Pho which is made with banh pho which is a rice noodle. It is usually made with a beef stock in restaurants however we make it with chicken stock in our house. We add greens such as kale, spinach, or baby bok choy and other veggies such as mushrooms and green onions. We add a trace of ginger and top it with bean sprouts, basil and chilies. It sounds like it is much the same as your Ramen Dish. I will add some grated carrots for color and I like the hard boiled egg I see you have. I will get both halves because my wife does not enjoy eggs nearly as much as I do. Nice recipe, thanks for all the great pictures that bring it to life. Chef, I’ve been wanting to make Pho, myself. Do you have a recipe that you’d share? I LOVE any kind of soup that comes in a vat, with an excellent broth and lots of interesting things to poke into it = PHO. Here’s the deal. You come to my house and I’ll fix you a bowl of RAMEN, and then I’ll come to your house and you can fix me PHO. Deal? I made this recently and it was SO TASTY! The littles loved choosing things to add to their bowls. 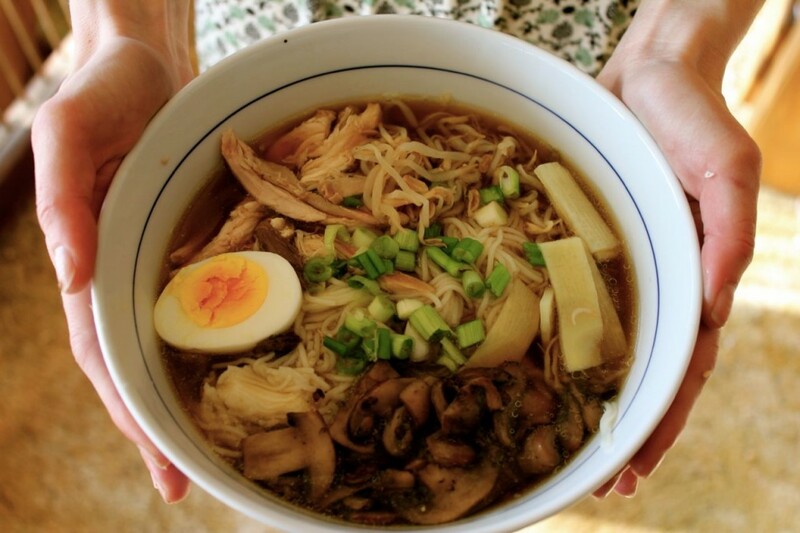 Hubby – who questioned this Experiment Night meal (and requested we just eat the ramen from the package like our college days) – was surprised at how good it tasted. I made some slight revisions: I left out the Kombu (after soaking, I tasted it and knew my fam wouldn’t go for it), and I omitted the nori (I only had nori that was over 3 years old…time to clean the pantry!). But the tare – this added such a depth of flavor! I loved it! This was a hearty and delightful dish. But I totally understand why the restaurants charge $8 for it. They have to pay someone to wash All.Those.Dishes. Thanks for sharing a great recipe, Amy! I’m so glad you reported back to me! And I’m so happy that you and your family liked it! I agree, that it’s a dish that you’d make for a special occasion–but, but, but . . . sometimes LIFE is a special enough occasion for it, don’tcha agree?